Shettleston Football Club The history of Shettleston Football Club is as interesting and invigorating as any fan could wish for, and the rise of their present day fame is enough to make that fans chest swell with pride. In 1902 there were three juvenile teams in the district, Wellshot Albion. Eden Thistle and Westburn Rovers. Some soccer –minded local men decided that it was time to have a junior club and so they held a meeting in a Shettleston cafe to discuss the proposition. Starting with no capital whatever Shettleston received their first strip, blue in colour, from the juvenile teams. Thus equipped they started their first season by handing out a 2-0 to Baillieston Thistle. In their next game they beat Carmyle Fernlea 3-2. And in their third game they drew 2-2 with Benburb at Govan. In all , they rounded off a very successful first season by losing the League Championship by one point. Today Shettleston hold the distinction of having received the largest transfer fees for junior players in Britain. The older fans will remember Hood, who went to Everton for a record sum, and later Alec Jackson who created an all time British record for a junior transfer fee when he went to Birmingham. The present Lord Wheatley, Q.C. played for the team at one time and his deadly left foot, which he used with unerring accuracy when he got near the opposition’s goal is still spoken of where older fans meet. More players have turned senior from Shettleston than any other junior club in the country. 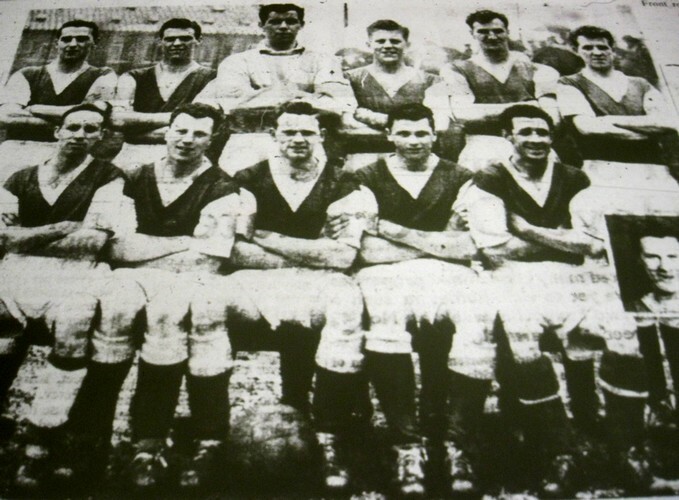 For instance, former Town players who were capped for Scotland include Jimmy Fleming and Jimmy Marshall (Rangers) and Alec Cheyne (Aberdeen) who scored the only goal of the Scotland v. England international in 1929, direct from a corner kick one minute from time. And of course Tommy Doherty, who played for Celtic and Preston North End before settling for Arsenal, is another to add to the star-studded array of men who made good after playing for Shettleston, the club that started on a shoe string. Frequenters of Well Park and followers of the Shettleston Juniors will be interested in the success of Willie McIntosh, their captain and right back who partnered that clever little left back , Steve Mitchell. Willie went to the States exactly three years ago and after a short time there found a place in the team of the Indiana Flooring Co, a large firm of building contractors. He has kept his form and is considered the handy man of the team, always being placed where the battle is fiercest, because he says it should be clearly understood that it is not Parlour Football which is being played in America. His experience with the Town has stood him in good stead, and he is never happier than when the game develops into a rough and tumble. If a few men get disabled on either side, substitutes are allowed up to 15 minutes from the end, so that something like 22 men strip for each side before the game starts. Willie was selected last season to represent Scotland against America, when he played well up to tradition. While McIntosh plays football for the team, he has a good appointment on the staff of the firmand is doing remarkably well commercially. He would not advise his friends over here to believe all the wild story’s about big American transfer fees and wages which he says are generally to be taken with a handful of salt. He wishes his old pals in Shettleston the best of luck and would be delighted if they again lifted the League flag.